The City of Newark recently completed the new reservoir, the first water supply impoundment in Delaware since the Great Depression. The City also successfully funded new water treatment plants along the White Clay Creek and at the south wellfield, The City was one of the first to employ open space zoning and now almost all of the floodplain along the White Clay Creek and Upper Christina River are now part of the park system. Newark is one of the only towns that employs a utility approach and publicly maintains storm water facilities. Along with the county, the city of Newark is a key signatory to the White Clay Creek Wild and Scenic River Watershed Management Plan. We completed a water rate survey of over 60 water purveyors in Delaware and surrounding states of Maryland, New Jersey, and Pennsylvania. We update the water rate survey every 4 years. Presently, Newark’s water rates are in the 30th percentile, still quite low compared to other purveyors in Delaware and in adjacent states. The University of Delaware Water Resources Agency prepared a water supply distribution model for the City of Newark Water Department using United States Environmental Protection Agency EPANET 2 software. EPANET 2 is a computer simulation model designed to predict the hydraulics of pressurized water distribution pipe networks. The network consists of pipes (links), nodes (junctions), pumps, valves, storage tanks, and reservoirs. EPANET 2 models the flow and velocity in each pipe, the pressure at each node, and the height of water in each tank. EPANET 2 runs on a laptop or personal computer using Windows operating system which allows point and click entry of input data and color coded output maps, tables and graphs. One of the advantages of this model is the software is free and can be used in a point and click format on a laptop or personal computer. University of Delaware civil engineering students assisted in the development of this model which includes 925 pipes and 680 nodes. The WRA constructed a sanitary sewer model for the City of Newark using the USEPA SWMM model. 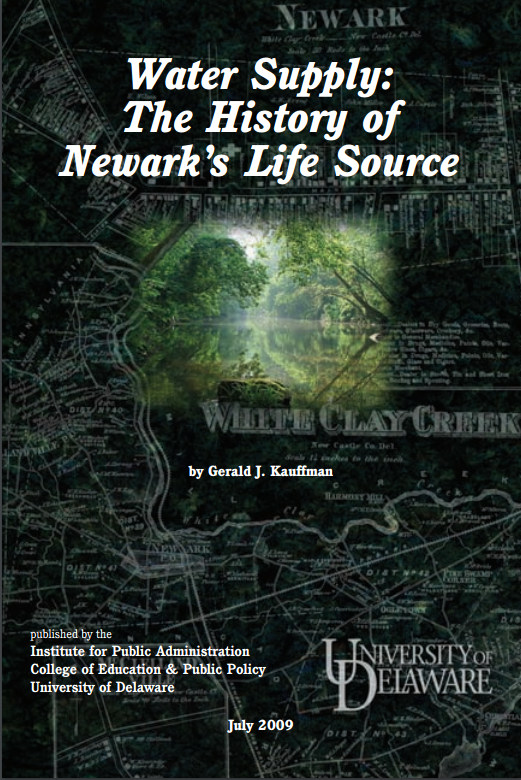 The UD Water Resources Agency prepared a report summarizing the natural resources protected by the City of Newark’s municipal code in the source waters (Levels 1A, 1B, and 2) upstream from the drinking water intakes along the White Clay/Red Clay Creeks above Stanton and the Christina River at Smalley’s Pond. This GIS analysis tabulates the area already protected by code as part of Newark’s approach to meet the Delaware Source Water Protection Law of 2001. Level 1A areas are defined as 100-year floodplains and/or erosion-prone slopes, and Level 1B areas as buffer areas 200 feet from each side of streams. For the purposes of this study Level 2 areas are areas of the watersheds which lie within the corporate limits of Newark. Newark maintains a stormwater system in the Christina/White Clay watersheds with 60 miles of sewers, 200 miles of curb/gutter, 3,000 catch basins, 34 stormwater ponds, and 500 floodplain acres. The City considered a stormwater utility as a dedicated funding source to recover $1.6 million annually for the operation of stormwater, water-quality, and floodplain programs largely required by federal and state laws and regulations. Decrease pollutant loads to City drinking water sources. Accrued to tax-paying and tax-exempt properties, which both contribute stormwater runoff. The average stormwater fee for a single-family home was $3.67 per month. U.S. EPA survey in mid-Atlantic, residential stormwater fees range from $2 to $40 per quarter. Wilmington and Philadelphia monthly residential fees are $3.03 and $10.80, respectively. About 34 percent of the land on 7,500 parcels in Newark is covered by impervious area. The mean impervious cover of single-family residential parcels in Newark is 4,000 sq. ft., which is defined as an equivalent residential unit (ERU). Option 2—$1,432,348 for $0.02 per sq. ft. of impervious cover ($6.75 per month single-family residential). Municipalities are authorized to form a stormwater utility in Chapter 40, Title 7, Delaware Code. Like many cities along the Atlantic seaboard, Newark was founded at a fortuitous location along the banks of streams such as the Christina River and White Clay Creek that could provide plentiful supplies for mill power and potable water. From the 17th century when the Lenni Lenape lived in Opasiskunk along the White Clay Creek to the opening of the Newark Reservoir in 2006, Newark’s growth flowed from the water supplies from these creeks and the ancient aquifers that flow under the city. Today after 250 years, Newark is uniquely the only town in Delaware able to access drinking water from both ground and surface water supply sources.